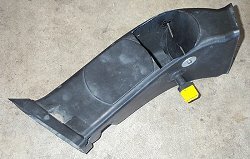 A great way to get a few extra horsepower for free with your factory airbox is to remove the airbox's internal baffle, remove the intake snorkel, modify the left brake duct to provide cool air to the airbox, and replace the factory paper air fliter with a performance air filter. The combination of these modifications will give you a few extra horsepower and adds a mean throaty growl to the car during acceleration. This airbox baffle and the water injestion baffle are not present on the Euro-spec E36 M3s. 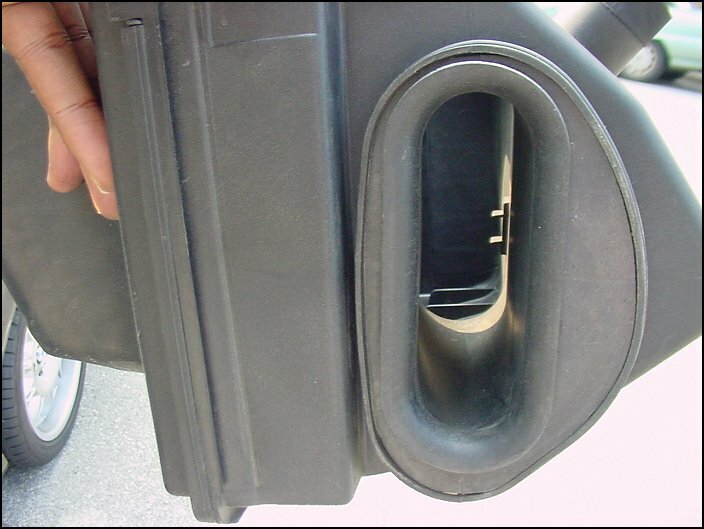 With the air filter removed from the airbox, you can see the baffle inside the airbox. 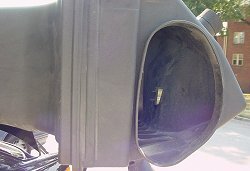 The baffle is there to keep the flow of air nice and quiet, but also creates a lot of restriction for the incoming air. 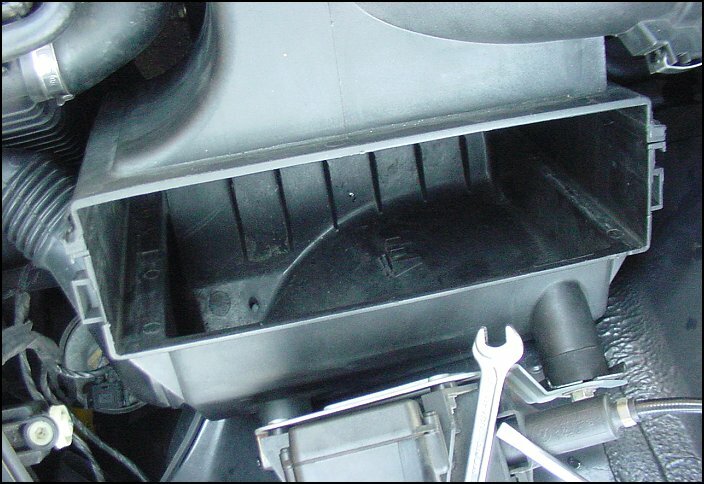 With the airbox removed from the car, you can see the opening to the airbox where the baffle comes into play. 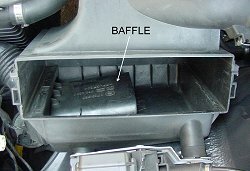 You can see how much restriction the baffle creates compared to the potential larger opening if the baffle were removed. 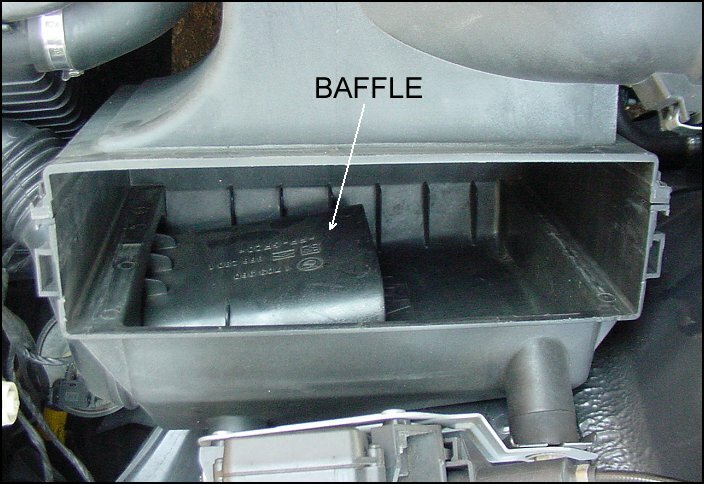 This is the baffle once removed from the airbox. It is easily removed by pushing in the tab on the underside of the airbox and simply sliding the baffle out through the front of the airbox. 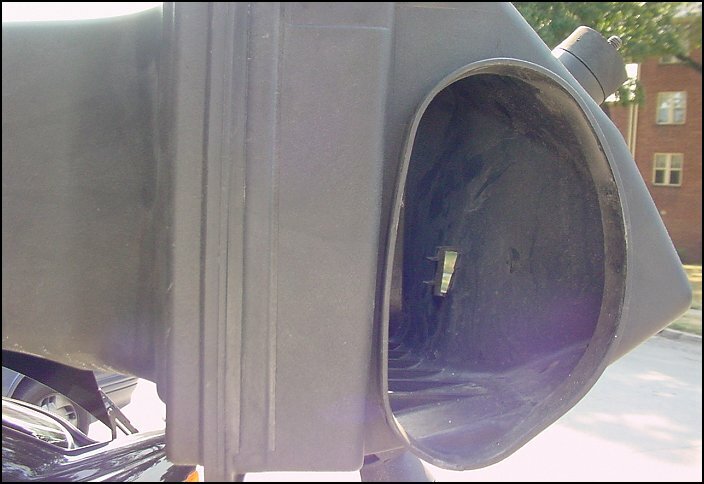 Now that the baffle has been removed, there is a much larger opening for the air to flow through. This larger opening also creates a throaty growl under accelaration. The "debaffled" airbox is reinstalled back into the car, and the paper air filter is replaced with a high flow performance air filter. 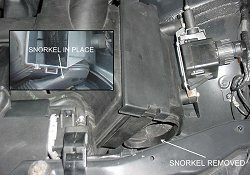 The intake snorkel is removed for increased air flow (the snorkel tube is fairly small), but the downside is that the airbox is more likely to take in hot air from engine compartment (the snorkel draws in air from the front of the car behind the headlight, which is cooler than the air in the engine compartment). 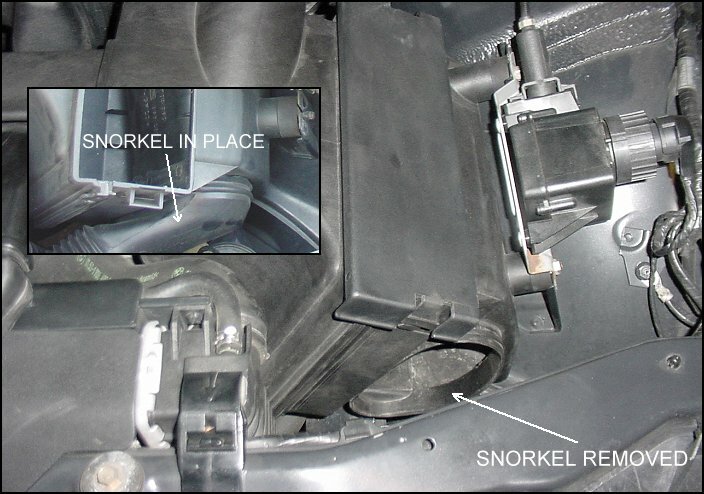 To provide cooler air to the opening of the airbox now that the intake snorkle is removed, the driver's side brake duct is modified by cutting a flap in the top and folding it down inside the duct at an angle where it is held in position with two screws. This angled flap directs cooler outside air coming in through the brake duct directly up into the area that the airbox will draw air from (the horn should be relocated or removed). The flap does not completely block the duct, so it still functions as a brake cooling duct. 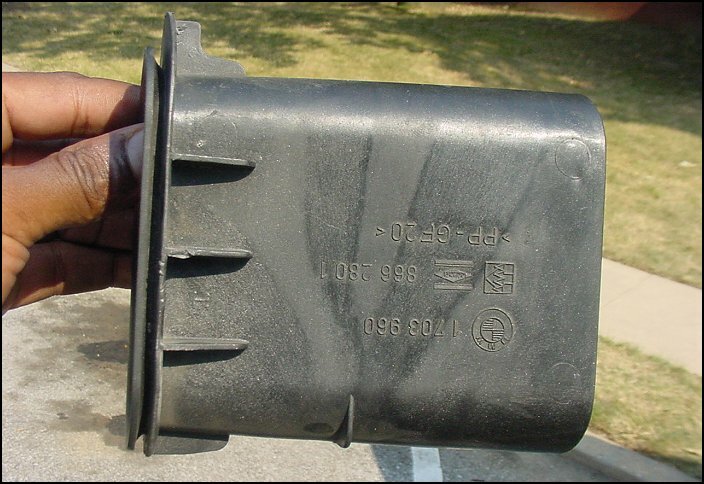 This brake duct modification would also be beneficial for aftermarket cold air intake systems.